I'm a picky (some say obsessive-compulsive) shopper, so there are few places where I feel confident walking in and just asking: "What do you recommend for ...," and believing in the answer. At J.P. Graziano, no matter what the "..." is, I always find the recommendations to be fantastic. 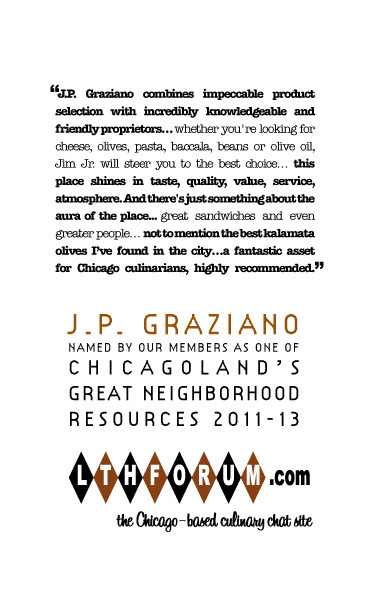 J.P. Graziano combines impeccable product selection with incredibly knowledgeable and friendly proprietors. Whether you're looking for cheese, olives, pasta, baccala, beans or olive oil - just tell Jim Jr. what you're planning to do with it, and he'll steer you to the best choice. What makes the place even better is that the Graziano's are also excellent cooks. So if you're not sure what the heck to do with that baccala or those olives, just ask for a recipe. They know their stuff. This Great Neighborhood Resource is a fantastic asset for Chicago culinarians, especially those like me who love Italian cooking. I heartily recommend it for this esteemed reward. Great nomination and one I heartily endorse (and considered making myself). Graziano's (together with Bari and D'Amato's, other great neighborhood Italian resources not too far away) is one of the places I was saddest to leave behind when we recently moved from a place within walking distance of that stretch of Randolph. Great selection of cheeses and dried pastas, a limited but interesting and well-priced (actually, everything there seems to be priced at bargain levels) selection of olive oils, and a great place for loading up on bulk legumes, I will continue to make Graziano's a regular stop even if it takes a little while longer to get there. I've never shopped at Graziano per se, but for the fantastic sandwiches (and their surprisingly reasonable prices, considering the quantity & excellent quality) alone, I second this nomination. A no-brainer IMO. Great sandwiches (cheap too!) and ultra-friendly people. Why can't other people replicate this simple formula? I had never been before, but swung by for a sandwich today to check the place out. Everyone working there was super friendly, the prices are totally reasonable, and the sandwich was really good. The tomato was so-so, which is unfortunate this time of year, and slightly better fresh mozzarella would have pushed the sandwich up a level, but for a sub-$7 lunch, awesome stuff. Over the past three years, Graziano's has been a fixture in my shopping life. This is the place that I choose to go when confronted by the need for olive oil, dried legumes, certain imported and domestic cheeses, dried pasta, olives, canned artichoke hearts, and a number of other products. Graziano's has a knack for carrying items with excellent price-to-quality quotients. The genial personalities of the Graziano family and their staff make the shop a pleasure to visit. Jim Sr. was a great man, and his son is a worthy successor. Warm handshakes and good advice are always readily at hand. As this section of Randolph Street changes, I wonder what will become of this place. For now, I'm happy that it's there. As the person who first brought Graziano's to the attention of greater Elteehaitchdom, I am delighted to see this wonderful shop nominated for a GNR. I would have done it myself long ago had I not been hung up on the narrow definition of 'restaurant' with which I was operating back then, when I was a regular poster. Cui cchiù sapi, menu cridi. Of course JP Graziano is a GNR. Hear, hear. peterc wrote: The genial personalities of the Graziano family and their staff make the shop a pleasure to visit. Jim Sr. was a great man, and his son is a worthy successor. Warm handshakes and good advice are always readily at hand. Warm handshakes, good advice and a very reasonably priced selection of dry goods, cheese, olive oil and olives. This nomination gets an enthusiastic yes from me. This one is a no-brainer. J.P. Graziano is what the GNRs are all about. Not to mention the best kalamata olives I've found in the city. It's no secret that I love this place. I strongly support Graziano's GNR renewal. It's one of those places that you think can't get any better, but then you try some new item (sheeps milk blue cheese, wild boar salami, a foccacia roll made with their housemade gardiniera) and you think, 'wow, this place IS even better'. Graziano's has it all--excellent products, warm, knowledgable proprieters, history, atmosphere. Tante grazie to Antonius for introducing it to the forum!! When I first started working a block away from Graziano, I went there 16 times in the first month. The funny thing is, I didn't stop going there because I was at all sick of it - I had to force myself to go on hiatus because it was getting out of hand. Now that they're making Will Specials, they're back on my lunch menu (I'm exercising some moderation this time, however). Great food, great people, and some cool stuff for sale. Most definitely still a GNR, in my book. Graziano's is one of the places for which I am most greatful to LTH. Just this past weekend, I spent a lovely half hour chatting with Jimmy who couldn't have been nicer and treated me like he'd known me for years--and it was the first time we'd met. Just having the opportunity to purchase such carefully selected goods is wonderful--from the briny but not "salty" white anchovies to the lusciously silken burrata to the REAL deal Italian blood orange juice to foccaccio baked by Crumb with Graziano's giardiniera. This is a very special place and I am indebted to LTH and the GNR's for pointing me there. Jimmy has some great plans for collaborating with his neighbors on some very exciting new products (fresh pasta ) and expanding to include more seating so we all need to keep up the support!! To me, this is a textbook GNR. Their products and service are phenomenal. I love the quality of the goods and the fact that in many cases, they are items that simply cannot be found anywhere else in town. Shopping at Graziano's makes me look like superstar in the eyes of my guests every single time. I gleefully support renewal. I agree ronnie, to me this one is a no-brainer. Count us in on supporting this nomination. Renew please. Great service, fantastic selection, and great people, we love this place.